Is our attitude of entitlement causing us pain? We recently found ourselves with our nearly 2 year old daughter at The Royal Children’s Hospital late on a Sunday evening. After being triaged we joined the busy waiting room, sitting next to a man who had brought his child in to be seen for a mild viral illness. He huffed and fidgeted enough to let everyone know that he was not happy being made to wait as his son slept beside him. After half an hour he loudly declared “our health system is just so stuffed….” . I thought about his statement, reflecting that we were sitting in one of the world’s best hospitals (that place is amazing! ), waiting to see medical staff who we trust are going to be exceedingly well trained, for absolutely no cost. I paused for a moment, before politely suggesting to him that, to be fair, if the nurses had thought that his son was very sick, he would have been seen without delay, and that I was sure that they would take good care of them when they did eventually get seen. He conceded and quietened down, while I continued to ponder about our “entitlement culture”. In our very clever western society, we have this expectation that medicine will have all the answers for us – got diabetes? Take medication. Obesity? Lap band surgery can help. Break a bone? We can fix that. Headache? Take a pill. We get so complacent about our advances that some people forget how and why they came about, and that years ago we didn’t have such a black and white mentality that things would work out Ok. At the extreme end of this spectrum, people might feel so safe that they might choose not to vaccinate their children. And what happens when it goes wrong and the surgery or treatment fails to fix the broken bone completely? “They stuffed it up” is often the idea that the patient will take away from their experience, which I believe comes from this entitlement culture – we expect nothing less than perfection. The problem with this black and white approach is that it can set people up with some very unrealistic expectations and a poor understanding of their condition, which might lead them on to develop chronic pain. If you happen to be the clinician attempting to lead them out of their pain spiral, getting them to move through this blame, is going to be a key component for getting better functional outcomes. Directing their understanding of their condition towards one that fits with our modern day understanding of pain physiology is going to be the best way to help reverse the spiral. I recently treated a middle aged man, who had chronic pain following knee joint replacement surgery, who was very angry at his surgeon. He was adamant that it was all the surgeon’s fault because he was worse following the surgery. On further discussion though, he revealed that the surgeon had not been emphatic that the surgery was going to be the answer to this relatively young man’s problems, and had suggested that he wait a few years and continue trying more conservative treatments. The patient, keen for the quick fix to fit in with his work commitments, had pushed for the surgery despite his recommendations and despite further informed consent discussions that detailed the possibilities of less than favourable outcomes. We did some pain education sessions, where we discussed in detail the changes that occur within the nervous system in the chronic pain setting. In this case, it was also very helpful to help this man to challenge his thoughts around “fault” and “blame”, with reference to these physiological changes, because it enabled him to take back a level of control and responsibility for his condition, which helped with his commitment to the movement rehabilitation program we started him on. After that shift in his thinking, he seemed to make gains a lot quicker. Pain is a subjective experience. It is vastly influenced by many social and emotional factors such as baseline anxiety and depression levels, the context of the pain and our understanding of the condition. Consider the difference between the athlete with DOMs following a big training session, and a person with muscle pain following a traumatic assault. Where the athlete believes that pain indicates a certain level of achievement as a means to their reaching their physical goal, it is likely that they will view that pain in positive light and have minimal associated distress. Their previous experience tells them that it will be short lived and is not harmful and their coaches will re-enforce this concept. For the person dealing with pain following an assault however, a whole different picture will be at play. Firstly it is likely there will be fear and uncertainty around what underlying tissue damage has occurred and if there is going to be ongoing issues. Additionally, the intense emotions attached to the initiating event will be difficult for that person to separate from their pain experience. So whilst on a nociceptive level the two events might be similar, as a lived experience, the two scenarios will be poles apart. Different cultures have various ways of expressing and accepting pain as part of life. Generally this behaviour is modelled by older generations to younger generations. Where stoic cultures will tend to complain little in the face of pain and make little fuss over small injuries in children, others will verbally and physically express their pain, and the slightest sniffle in the child can be labelled as an illness and treated with much attention. It begs the question, does the tendency to magnify a pain experience in our expression of that pain, render us more likely to go on to develop chronic pain because of the catastrophising nature of the behaviour? Or is the opposite scenario at play, whereby the effect of being heard and having our pain validated, has a comforting and affirming effect which disarms the hold it might have on us? Is a support group scenario where people discuss their chronic pain a help because of the group camaraderie, or a hindrance because of it’s tendency to encourage misery and magnification? The answer, as with most things in the pain game, probably falls into the “it’s complex” box. This entry was posted in Uncategorized on February 28, 2015 by beyondmechanicalpain. The San Diego Pain Summit #sdpain brought together over 120 clinicians from eight countries. Largely made up of physiotherapist’s with a special interest in pain, it was also well represented my massage therapists, Feldenkrais practitioners, exercise practitioners and even an osteopath or two. The first event of its kind in the world, it was wonderfully put together, blending science and clinical concepts. With my pain training coming out of Sydney University medical school, my usual ‘pain gang’ are largely medically orientated bunch, and I frequently feel that I’m having to defend my position as a manual therapist working with a chronic pain population, particularly because osteopaths are often seen as very manual technique orientated. At #sdpain it was affirming to be surrounded by people who were working in the field of chronic pain as manual therapists, confidently applying approaches such as pain education, graded movement approaches and lo and behold, manual therapy, with good clinical outcomes. I felt very at home! Lorimer Moseley kicked off proceedings on day one with his witty, funny, engaging and incredibly relevant science and clinical information. The idolisation of the man by the group at large was evident by their engagement, the lines of people afterwards to ‘pick his brains’ and the subsequent frequent references to him and his work by virtually all of the speakers that followed. 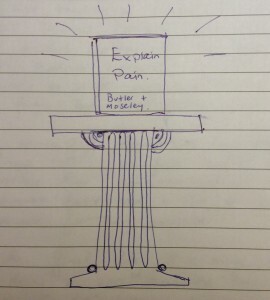 It sometimes felt like a weekend of worship at the altar of Explain Pain. And rightly so. Moseley and his equally charming co-author, David Butler, literally ‘wrote the book’ and in doing so, started a revolution that has had a massive, world wide influence on our understanding and treatment of chronic pain, particularly in the world of manual therapy. They have lead the charge with innovative research and accessible courses showing how to apply the research clinically. For practitioners engaging with their material, opening this Pandoras box can be both exciting and terrifying, and for many, the truth that lies in the science can make it prohibitively scary to engage with (as discussed here earlier and here by Jason Silvernail). Explain Pain helps make the transition from the dark side of a biomechanical model to the more widely excepted biopsychosocial model as pain free(??) as possible. 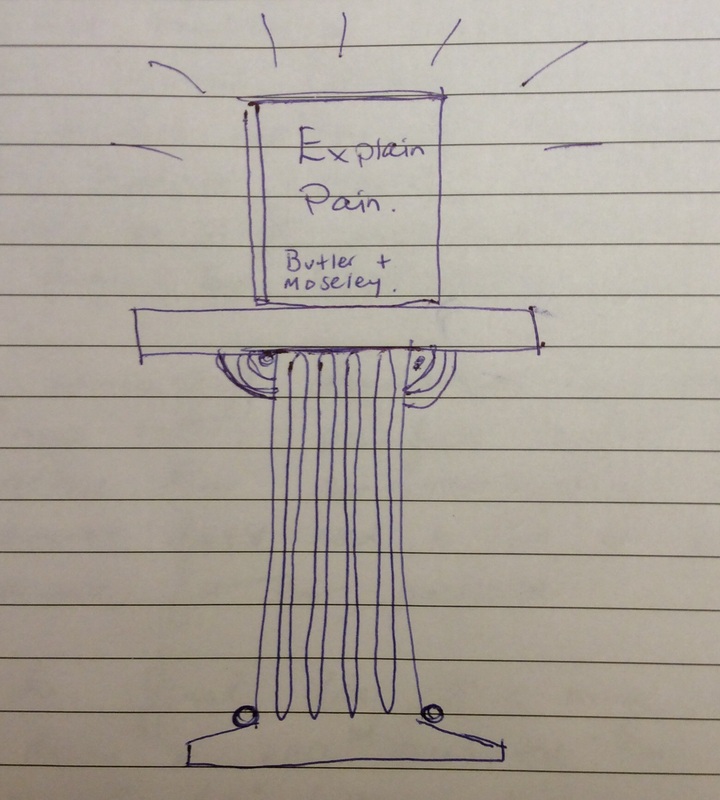 Jason Silvernail followed Lorimer with a beautiful, big picture overview of how getting practitioners both medical and manual, as well as society as a whole, to shift their understanding of pain, is it tough but worthwhile pursuit. Cory Blickenstaff demonstrated how teaching patients to move within pain free ranges can help to reassure their sensitised nervous systems that movement doesn’t need to be a frightening experience. On the final day, Eric Kruger, a US physical therapist doing a PhD in psychology at the University of New Mexico, presented ‘Pain in the face of uncertainty’. Listening to him speak, I had an urge to start high-fiving people around me, not unlike the first time I listened to Peter O’Sullivan on this pod cast whilst I was doing the grocery shopping at Coles one Sunday! He focussed around why our patient’s uncertainty about their predicament largely drives their feelings of helplessness and frustration, and how reassurance, rapport and a listening ear are more valuable than we can often imagine. He emphasised that allowing patients to express their pain is important and validating. He also strongly advocated setting expectations of flare-ups as being a normal part of the rehab process, which helps the patient to stick with the treatment approach when that inevitable first flareup occurs, rather than walking away and seeing their treatment experience as yet another failed treatment. All of the other speakers were fantastic, and the similar themes, language and approaches that were consistently coming across in their respective modalities were reassuring. It continually demonstrated a baseline understanding that all of the speakers were operating from – that of a biopsychosocial approach played out in daily practice with every patient who walks in the door. From a social perspective, the conference for me has been a hit! I have made many wonderful connections and have enjoyed my time in San Diego. I hope to be able to return next year and can’t recommend it highly enough. This entry was posted in Uncategorized on February 23, 2015 by beyondmechanicalpain.